June 16, 2015 – NASA’s Cassini spacecraft will make a close flyby of Saturn’s moon Dione today, coming within 321 miles (516 kilometers) of the moon’s surface. The spacecraft will make its closest approach to Dione at 1:12 p.m. PDT (4:12 p.m. EDT) on June 16. During the flyby, Cassini’s cameras and spectrometers will observe terrain that includes “Eurotas Chasmata,” a region first observed 35 years ago by NASA’s Voyager mission as bright, wispy streaks. After the Voyager encounter, scientists considered the possibility that the streaks were bright material extruded onto the surface by geologic activity, such as ice volcanoes. Cassini’s close flybys and sharp vision later revealed the bright streaks to be an intricate network of braided canyons with bright walls, called linea. Cassini will also try to detect and determine the composition of any fine particles being emitted from Dione, which could indicate low-level geologic activity. Mission controllers expect images to begin arriving on Earth within a few days of the encounter. 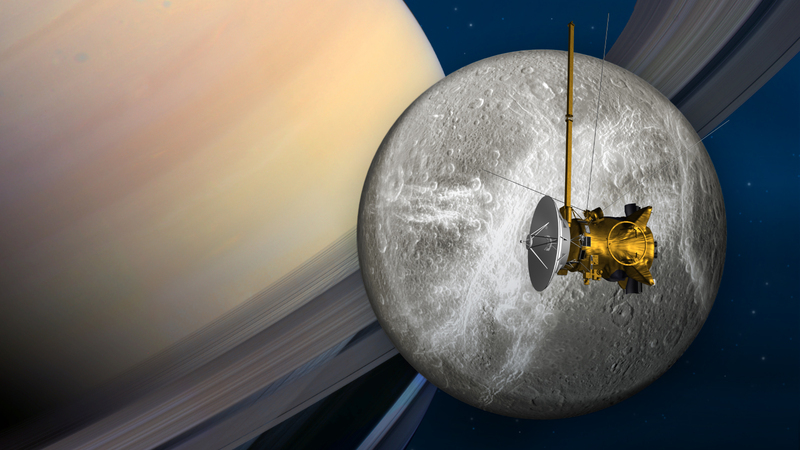 This flyby will be the fourth targeted encounter with Dione of Cassini’s long mission. Targeted encounters require a propulsion maneuver to precisely steer the spacecraft toward a desired path above a moon. Cassini’s closest-ever flyby of Dione was in December 2011, at a distance of 60 miles (100 kilometers). The spacecraft will fly past Dione one more time, on August 17, swooping within 295 miles (474 kilometers) of the surface. In late 2015, the spacecraft will depart Saturn’s equatorial plane — where moon flybys occur most frequently — to begin a year-long setup of the mission’s daring final year. For its grand finale, Cassini will repeatedly dive through the space between Saturn and its rings. The Cassini-Huygens mission is a cooperative project of NASA, ESA (European Space Agency) and the Italian Space Agency. JPL, a division of the California Institute of Technology in Pasadena, manages the mission for NASA’s Science Mission Directorate in Washington. The Cassini imaging operations center is based at the Space Science Institute in Boulder, Colorado. The Laboratory for Atmospheric and Space Physics, also in Boulder, contributed the Ultraviolet Imaging Spectrograph.